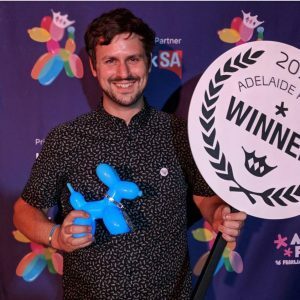 Announcing: Scottish Magic/Theatre/Science production KEVIN QUANTUM: ANTI-GRAVITY received the award for BEST MAGIC at Adelaide Fringe on Sunday Night at the close of the Festival. This is the second year physicist-turned-magician Kevin Quantum has performed at the Adelaide Fringe, in 2017 he returned to Scotland with a High Commendation Award. However this year he took the main prize ahead of almost thirty other magic shows in the Fringe programme – and is the first ever Scot to do so. For those that are unfamiliar with the world of “Fringe” – Adelaide Fringe is a 5-weeks long arts festival, second only in size, globally, to the Edinburgh Fringe. The BEST MAGIC award may be the most prized accolade you can receive for Magic on the festival circuit. Hailing from Fife, but living now in Edinburgh, Kevin left his Physics research post back in 2006 after appearing on a Channel 4 reality television show called “Faking It”. In just four weeks Kevin was trained how to be a magician. As part of the process he received tuition from magic royalty Penn and Teller in Las Vegas and fooled magic legend Paul Daniels in the ‘final test’. He now tours the world with his shows – always fusion of science and magic. He is also Artistic Director of the Edinburgh International Magic Festival, now in its ninth year, which takes place from the 11-19th May 2018 in Edinburgh. Inspired Edinburgh – Interview with Kevin Quantum Is magic an art? And other questions.